6 HUGE Stars!!! One of my all-time favorites! 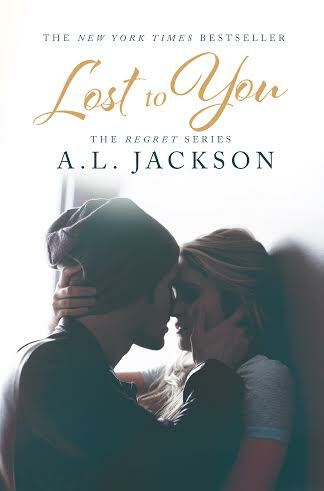 I had the novella, Lost To You, along with the subsequent book, Take This Regret, downloaded on my Kindle for awhile. While waiting for another book to be released, I decided to finally read the book… And.Oh.Wow. I LOVED LOVED LOVED LOVED these two books. They are definitely part of my all-time faves. I thought the story was so authentic, so real and heart-wrenching that I felt tremendously invested in the story and its two main characters, Elizabeth Ayers and Christian Davison. And they become friends. Best Friends. And then one night, everything changes. This novella is seriously romantic. A.L. Jackson depicts the kind of romance you dream of but yet is very much rooted in the reality and angst of its nature… filled with insecurity and attraction, with love and disappointment. But Christian adores her and Elizabeth comes alive alongside him. And then comes Take This Regret. Deep breath… Prepare yourselves after reading the novella to have your jaw fall to the floor. The story picks up with Elizabeth confessing to Christian that she’s pregnant. You begin completely incredulous that you are at this place after finishing Lost To You… you were on such a high. Fast forward 5 years, you find each of them living their own complicated life without each other. Christian is heading up one of his father’s law firm in San Diego. Christian’s father is seemingly an awful person… rich, arrogant, uncaring and overbearing. Christian is incredibly unhappy, but successful. Elizabeth has raised her 5-year-old daughter on her own and has faced troubles that are heart-breaking. I found myself so angry at Christian that I wanted to throw my kindle to the wall… and coincidentally, I felt that emotion many times throughout the book… mostly at Christian, that his enormous mistake set a course of events in motion that he can never take back, but many times also at Elizabeth’s stubbornness and fear. One fortuitous day, Christian runs into a little girl with black hair and blue eyes at the grocery store and feels immediately connected with this girl. Could it be his daughter? In short, Christian finds Elizabeth and their daughter, Lizzie and realizes the magnitude of his mistake. He is desperate… absolutely desperate… to get them back. But rightly so, Elizabeth is beyond angry and resentful because he left her. She can’t imagine forgiving him, despite the love that he has for Lizzie. The remainder of the story details their journey. I’ll tell you now that I was overcome with emotions many time while reading this book. Many times I was happy and hopeful. Many, many times I was so sad… for Christian, for Elizabeth and even for Lizzie. I cried multiple times throughout. And you are in no way certain of what’s going to happen because the story is so authentic, heartfelt and intense. Both Elizabeth and Christian are deeply flawed, forever marked by their experiences, both often times angry and paralyzed by fear… both many times overwhelmed by their undying love and attraction. These books are perfection. Just writing this review makes me want to re-read them because of the experience they gave me. This is what a love story is all about, folks. 6 stars is my highest rating and it is well-deserved here! LOVE. These books are amazing… one of my all-time faves. DOWNLOAD THEM NOW! Wow. Wow. Wow. Thank you for these absolutely amazing reviews.